I love sleep! Who doesn’t? 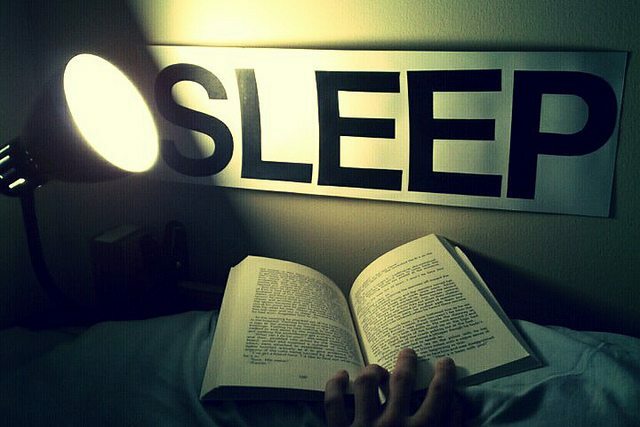 In fact, I have heard life described as a series of distractions from sleep! In all seriousness though, sleep is important both for work, and play, and is especially important if you are recovering from injury or training hard. The Withings Aura is designed to monitor your sleep with an accuracy that most phone and wrist monitors can only dream of – is it worth the asking price? 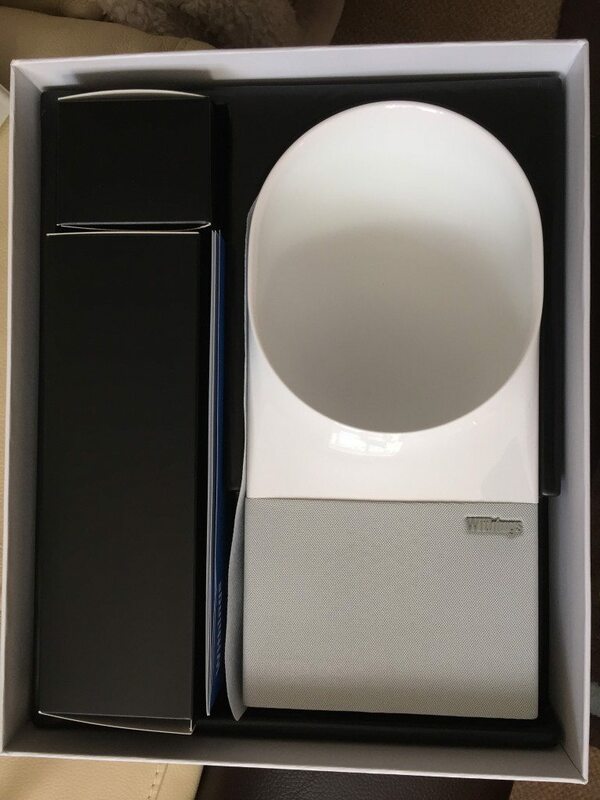 The Withings Aura consists of a a light, and a monitoring mat. When I opened the Apple-esq box (When did Apple seemingly take owner ship of the snugly fitting white box anyway?) I had a genuine surprise at the contents, which is impressive when you are opening a bit of tech which you know what it is! Not a flat face but an Ice cream scoop! The light itself is produced from a small opening at the base of the ice-cream scoop, that also contains a light sensor, allowing monitoring the luminosity levels in your room. The LED is angled to cast its light against the ice-cream scoop, producing a diffuse, soft and indirect light from the unit. The LED has a range of colours, and so can also be used as a white reading light. 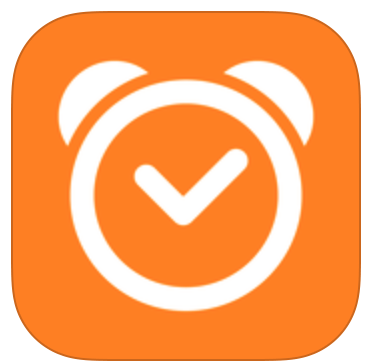 The Sleep Cycle Alarm, a little £1.49 app for IOS, which works by measuring your movement through the night through the internal gyroscope of your phone. The sleep monitoring function on the Garmin 920XT which is so rudimentary as to almost be useless! Sleep Cycle Alarm monitors your sleep across the night, by placing your phone underneath your pillow and recording your moments as you sleep. Depending on how still/fidgety you are is known to correspond to different stages of the sleep cycle – I’ll come onto how sleep “works” in a moment – this allows the alarm to try and wake you as you move into a lighter phase of sleep in the morning. The aim here is to hopefully have you waking feeling “refreshed” and ready to go, rather than like some reanimated corpse as I usually find myself imitating. 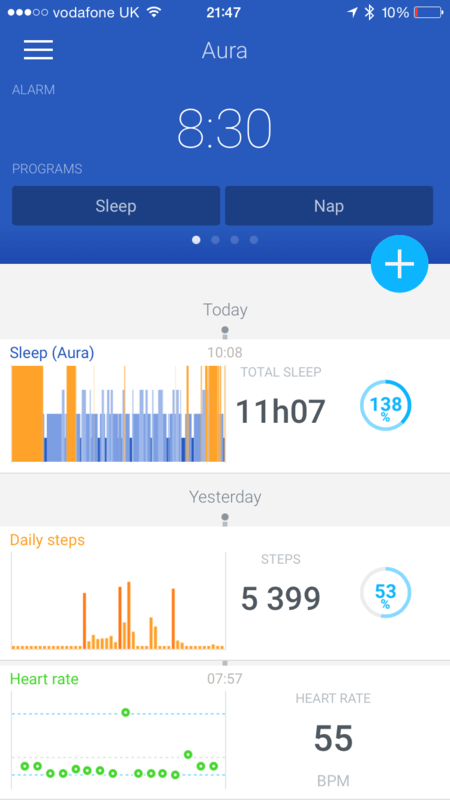 The Sleep Cycle uses a “wake up phase”, this is the buffer phase time that the app will look to wake you up in, trying to catch up in as lighter sleep as possible. But If you dont move sleep phases, the alarm will go off when you have set. When you do actually wake in the morning, you have the option of monitoring your heart rate using the camera and flash on the back of the phone to act as a simple visible light pulse meter. 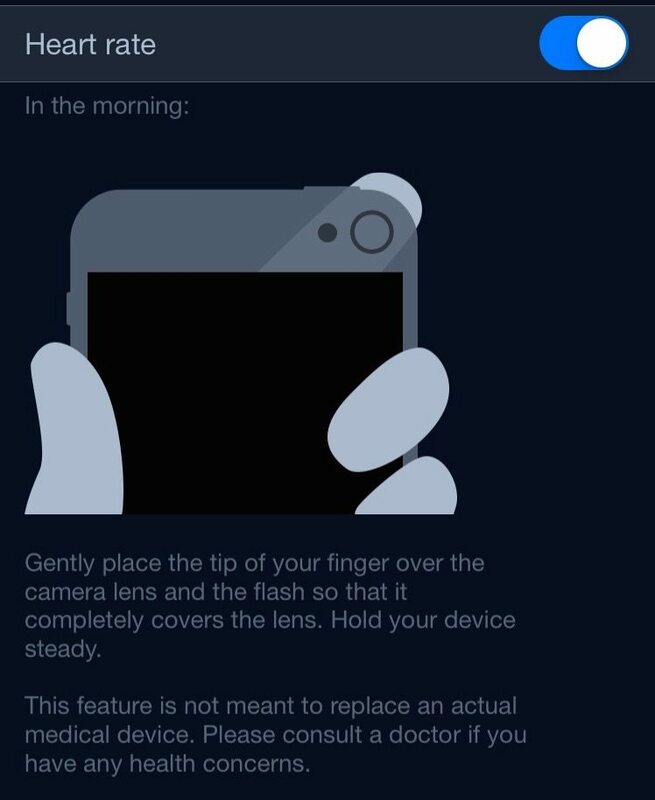 Checking your pulse through your phone camera – not when sleepy! HOWEVER, and its a big however, you are trying to check your pulse within moments of waking, as you try to switch the arm off. Almost without fail I find I’m not keeping still sufficiently, as i’m not really functioning, so maybe one day in the week, I’ll get a recording. Thus after 3 months of using the app, I’ve stopped bothering trying to check my morning pulse rate and leave it to my scales. A second issue with using the app, is that in order to monitor your sleep, you need to put the phone, whilst plugged in BY your pillow. In actual fact its going to end up UNDER your pillow, and can frequently end up getting surprisingly warm by morning. Has the app been effect at waking me up “refreshed”… maybe. Often the phone slips off the bed, thus getting no recording. When the phone stays in the right place, the movement monitoring is as you would expect from a phone app. Adequate is probably the best description. 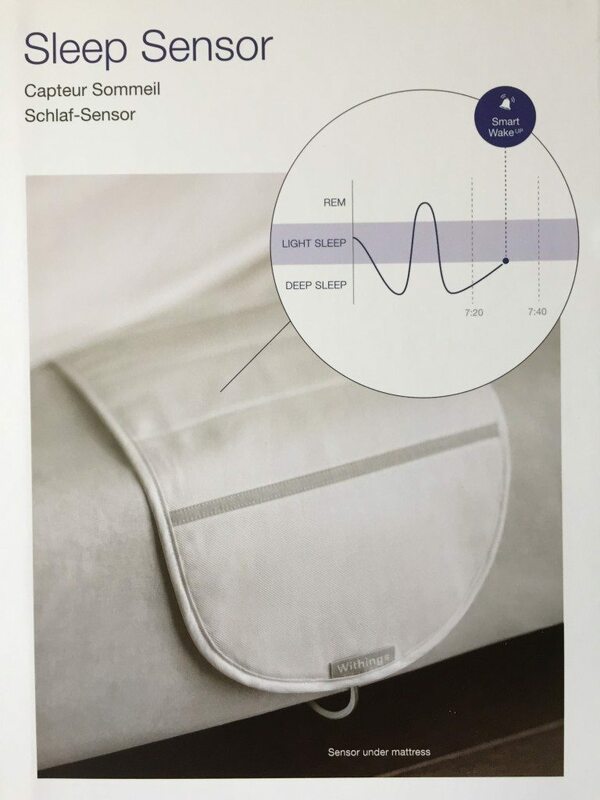 The big focus of the Withings Aura is accuracy, hence rather than using a method such as an armband (which is annoying) or a module to go beside the sleeper (which can fall off), the Aura System has a Sleep sensor has goes between the bed and the mattress. 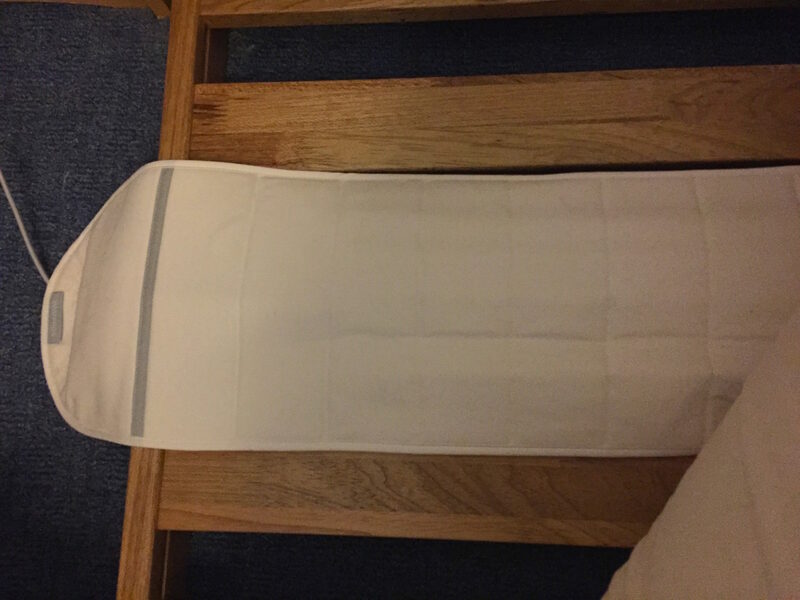 The sleep sensor is sized to reach to just under half way across a double bed, allowing single person sleep monitoring in a double bed, but two persons can be monitored with two sleep sensors plugged into one system. Something that the Sleep Cycle Alarm app fails badly with. If someone else is moving around it picks them up as well, whereas the Withings appears much more focused to direct toward pressure, and appears to work best with a bed slat directly in the middle. However if you have a flat bed that shouldn’t be an issue for you. The Sleep sensor plugs into the main Aura unit via USB. There are three sockets on the back, one is dedicated to the sleep sensor, the others are able to charge USB devices. However one can also be used for a second sleep sensor. Personally I found this a really nice little touch, as there are so many gadgets that we tend to charge in the bedroom now. 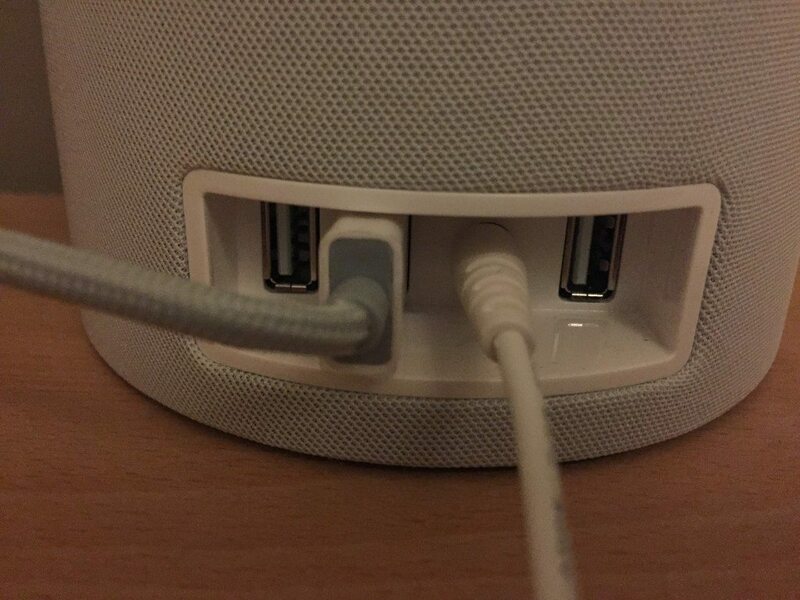 Having two free sockets, allowed me to dispense with an extension socket, and USB charging plugs – always a plus! It is this sort of thinking which Withings do very well…or so it seemed. Free USB – good thinking! At the front of the unit is the speaker system, and also the light sensitive clock – which nicely dims at night, but brightens during the day, for ease of visibility. 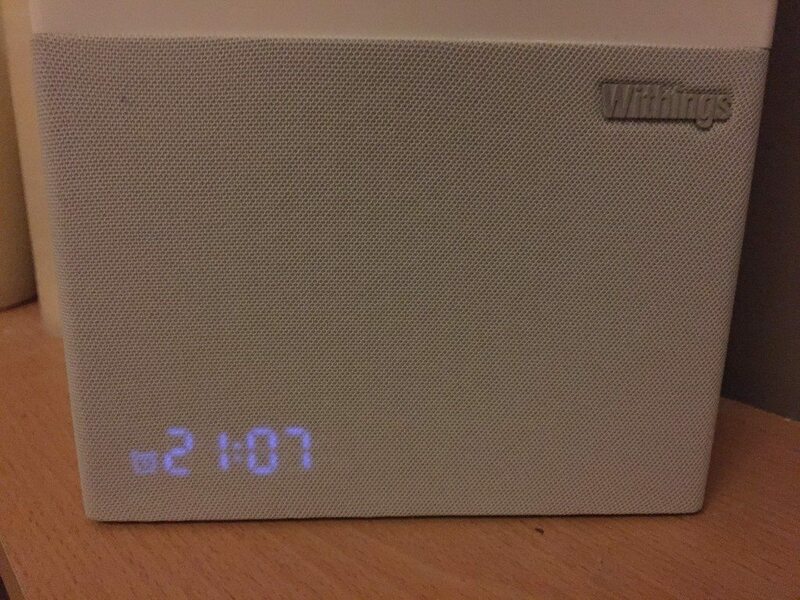 Here Withings shows its attention to detail again, with the connected home, taking the time on the clock from the internal time on your router when you connect the Aura to the WiFi. A small point certainly, but a nice one still. After the the Aura has been plugged in for the first time, the sleep sensor vibrates slightly, and a light within the sensor, where the cable emerges, switches on indicating calibration is taking place. Ultimately this means that you have to avoid sitting/lying on the bed for about 10mins after, until the light goes off – simples. Initially the Aura a pain in the neck to actually understand/get it working – largely due to the choice of touch sensitive strips on the side of the unit to control volume and brightness. 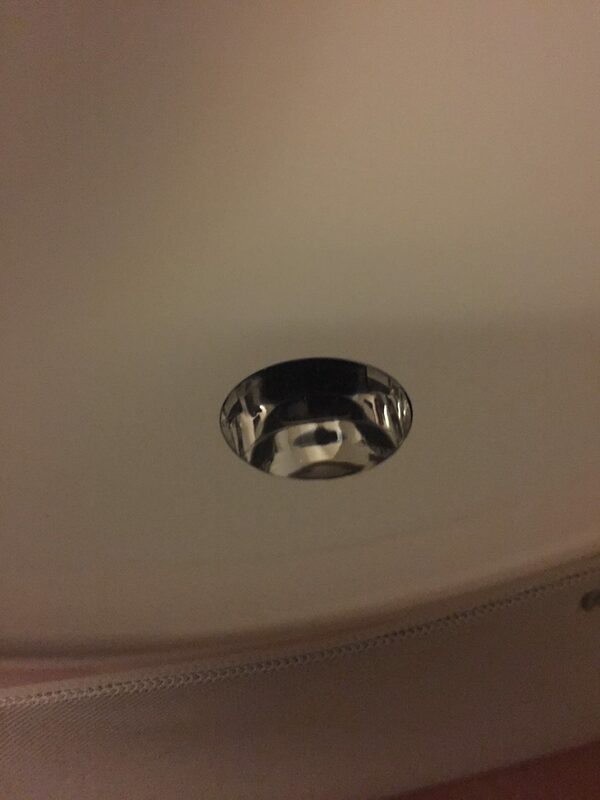 Additionally there is a touch sensitive pad on the top of the unit to tap/press to start programs – thankfully this is easier to use, but still requires a small learning curve. For what should have been a very elegant way to interact with the unit, due to the sensitivity of the sensors, they come over as simply unintuitive. I feel that the touch strips should have been switched out early during product development and replaced with simple buttons – which may have lowered the price as well. Speaking of snoozing – Setting up the alarms is done through the Withings app. From the Timeline screen, you can select either to start a Sleep program, or a shorter Nap program. 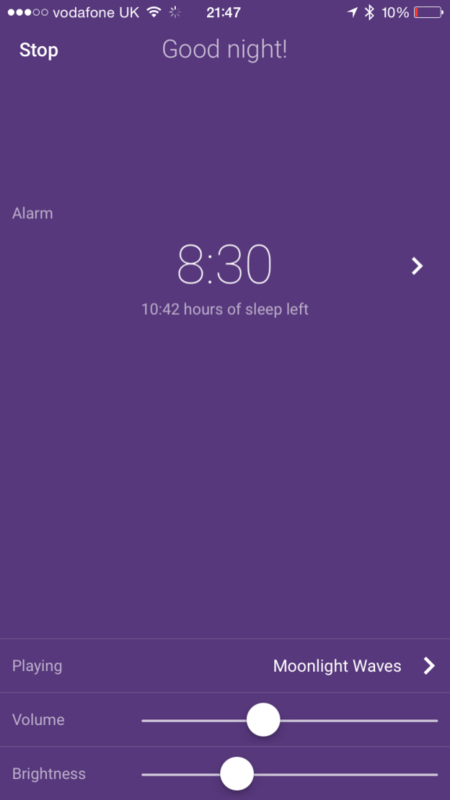 The app then allows you to pull the time to point where you want to set the alarm, and then select a wake up window, similar to the Sleep Cycle app. You can also control the brightness from this screen and the volume of any sleep soundtrack – if you want it. 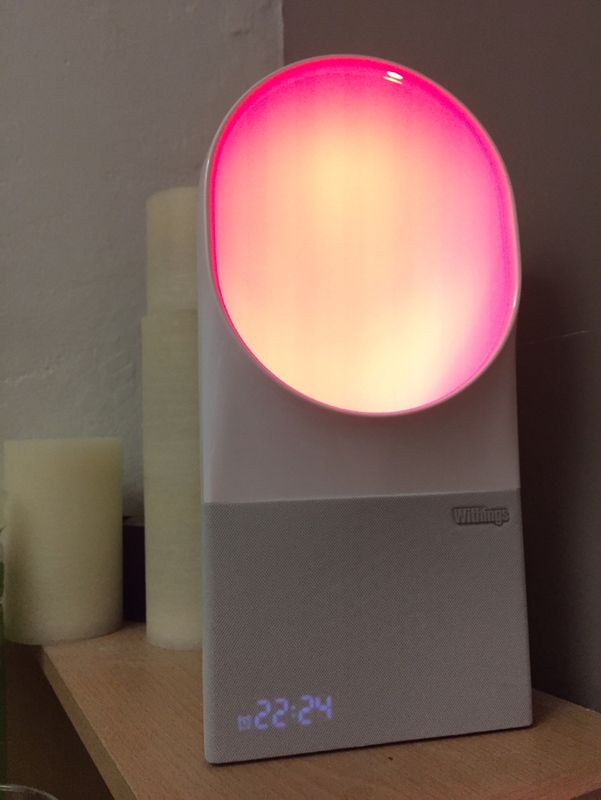 With the alarm set, you long touch for 2-3 seconds the top of the unit, which actives the sleep program from the App, triggering the unit to switch to a warm red coloured glow, and the music to start playing. This is probably a very personal point – The light and the waves dont seem to work for me. Although getting to sleep has always a slightly difficult one for me. I tend to read to distract my brain from the multitude of other things that bounce around in it. HOWEVER that said the Waves sounds, as the sleep programme begins, are VERY soothing. So in that respect its a win. The slow and gradual reduction of the brightness of the red glow, coupled with the volume of the waves gradually diminishing over about a half hour period is however very calming. Crucially if the lights and sounds dont work for you, you can move both sliders to the LEFT and have neither on when the sleep program starts. This is really what we are here for. The ultimate goal of Withings products and the host of other tech companies out there is to improve your overall health -through data. I’ve always had an interest in sleep health/medicine. The Dean at Warwick Medical school during my training was an expert in sleep health, whose big concern at the time was the lack of emphasis on this area in the medical curriculum. With the advent of the smart phone, and now the ubiquity of screens when have invaded the bedroom, there has been a renewed interest in sleep science, and how our 24hr life style is affecting our ability to sleep and thus our health. One of the big realisations is how blue light, associated with TFT/LED screens and energy saving light bulbs, diminishes your melatonin levels – your sleep hormone – and thus delays the onset of sleep. This knowledge is harnessed in SAD lights, and in the Wake Cycle of the Withings Aura, using intense blue light to help people feel more awake. 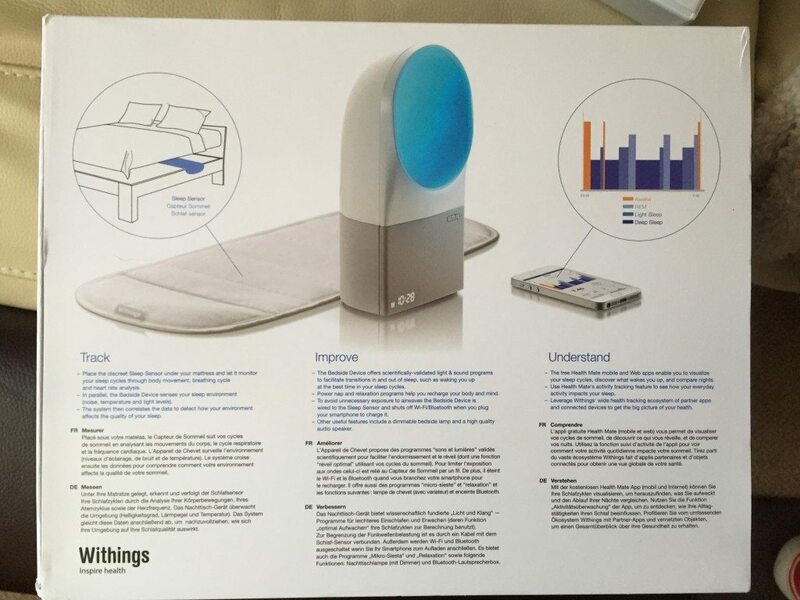 By using the Sleep Sensor under the mattress, the Aura is able to detect where you are in your sleep cycle. 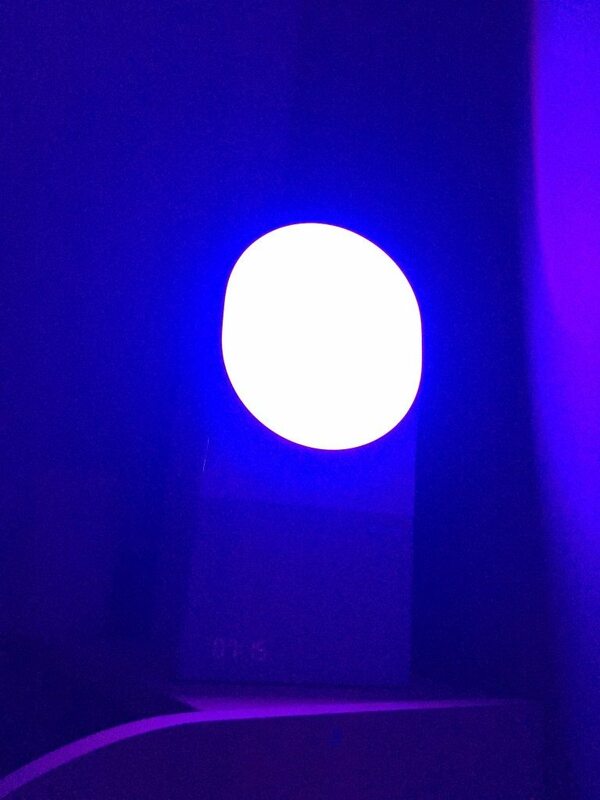 As your movement increases, the Aura detects you coming into a lighter phase of sleep, and when you are within the set alarm window, the Aura will switch on, and gradually increase the brightness of the blue light along which your chosen wakeup sounds. The idea being to support the natural process of waking up, rather than being suddenly woken up from deep sleep by an arbitrary alarm going off..
Waking up randomly during the sleep cycle, specifically when in deep sleep, can result in that horrible groggy sensation when you wake. The Aura is able to detect this lack of movement, and will try to wake you at an optimal time, related to the alarm window that you have set. In terms of experiencing the Withings Aura’s wake cycle, the blue light begins to get brighter, whilst very gentle music also increases in volume, also helping you wake up gently. I feel that the choice of this music is really important here and Withings has done a great job with their default music. It is able to wake you, but at the same time, does so gradually, and isn’t particularly jarring, as is the case with a normal phone alarm. The Aura is able to track a surprising about of data following a series of updates to the firmware. The real benefit here is that with the Aura, you can monitor changes your make to your bedroom environment, such as black out curtains, and see how the change in luminosity (measured through a sensor in the LED system) affects your sleep. Similarly you can see how the changing temperatures affect your ability to sleep, so increasing the heating at night if getting too cold etc. Personally I do like the heart rate monitoring system that the sleep sensor allows, as this gives you a very clear idea if you have been disturbed, but also a very accurate reading to you base heart rate, which can sometimes be a pain to monitor. Now I’m getting that monitoring, without any effort at all. The data can be viewed on the phone app, or on the Withings Health Mate site , although the information and graphs are the same. I was hoping that using the browser would allow for larger more detailed graphs. Which brings me to another point, data transfer. 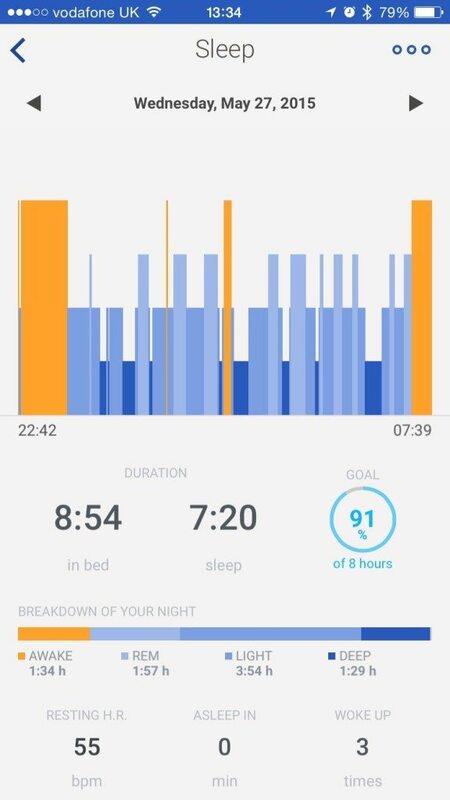 Frequently you can be quite far through the day before the Withings app has your sleep data on it. This could be related to the volume of data needed to transfer, but given how quickly it takes me to mail a photo to my phone I doubt it. Particularly as the Healthmate site seems to get the data much faster – this is something Withings has acknowledged, and is addressing through firmware updates, but as yet, I’ve seen no change. I am going to miss the Aura when it goes back. 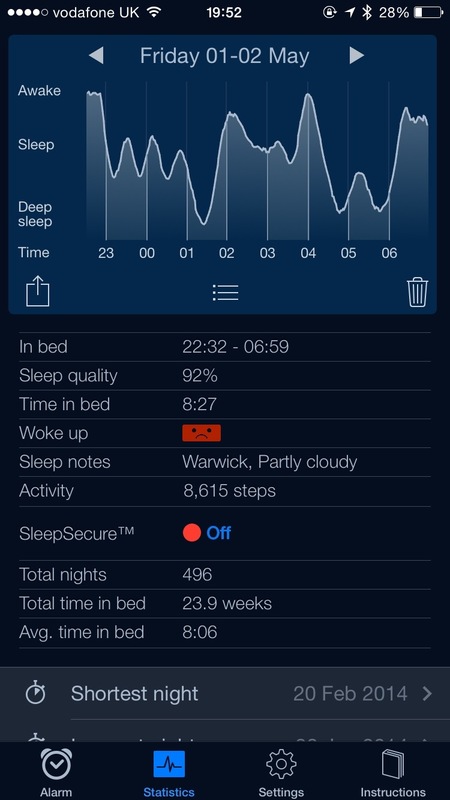 My sleep Cycle app cost £1.49p and has been a crudely effective before I started the use the Withings Aura. However the Aura costs nearly £200. The cheapest I can find is £193, which is a lot of money. HOWEVER if you compare it to the Philips Lumie lights, which have a similar role, to wake you up gently, they cost between £90 and £175 for the different models and have far less features. Suddenly the Aura looks much better value for money. The poor sensitivity of the touch sensitive sides is ANNOYING. The Aura initially has had some bad press when it was released. It rose to such a degree that the CEO of Withings commented that the Aura may have been released too early. However most of those issues and bugs, such as not initially being able to record sleeping heart rate, have now been addressed – Withings also is actively continuing to develop for the Aura and details intended changes for future firmware – and potential time lines on its firmware. This is frankly rare, and a very good example of customer service. 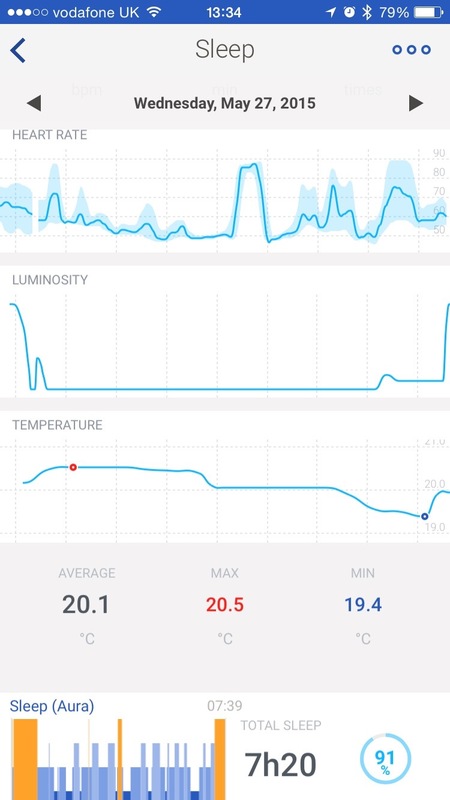 The data that I get from it, in terms of sleep, heart rate, number of rem cycles, temperature of the room, and luminosity are all helping me to slowly improve my sleep.